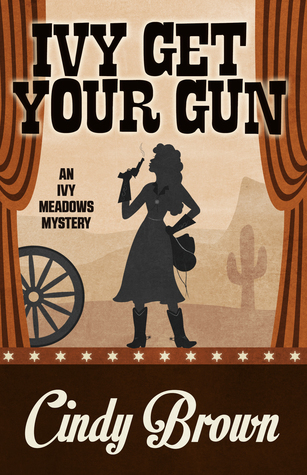 We’re back in an Ivy Meadows Mystery with Cindy Brown’s Ivy Get Your Gun. This time Ivy takes to the road for some out-of-town acting work, but she can’t escape the need to solve a mystery. The character of Ivy Meadows (aka Olive Ziegwart) is really growing now that we’re in this, her fourth mystery tale. She’s out of town, working at the Gold Bug Gulch in Arizona where she’s hoping for the role of “Annie” in Annie Get Your Gun. But of course Ivy wants people to know the real Annie, and not the phony character from the play. Which could be a problem since the director just wants some flashy entertainment. But when Ivy gets to Gold Bug Gulch she immediately gets caught up in a missing persons … er… animal case. A local pug named “Lassie” has run off with a pack of wild Chihuahuas and the owner fears that the wild coyotes will grab her. If only that were the worst of things to happen at the gulch…. An actor by the name of Mongo is killed during a ‘fake’ shootout when someone swaps the blanks for real bullets. Ivy goes undercover and channels as much of Annie Oakley as she can to get to heart of the mystery. This was a great step for Ivy … to get away from her uncle (even though she gets in touch with him a few times) and really be on her own as an investigator. We needed to see her step up and we did. But we also see her grow a little in personality. She’s still eager, enthusiastic, and reactive, but she appears to be stopping and thinking a little more. Her research into the real Annie Oakley, to prepare for her audition, also shows a maturity in theatre that we haven’t seen before this as well. But the maturity does not come at the expense of the fun. Author Cindy Brown keeps the entertainment level high while also making a stronger mystery. My only ‘complaint’ here is that I didn’t feel that the unraveling of the mystery was smooth enough. Too much came all at once, though we were being distracted along the way to notice it. It was only after, while thinking about what happened, that I wished I’d had a few more hints along the way. I work in professional theatre and have for much of my career and it is so nice to read a story that incorporates theatre so well. Cindy Brown clearly has experience in the theatre world beyond a small-town community theatre. I greatly look forward to the next Ivy Meadows mystery. Looking for a good book? Ivy Get Your Gun is the fourth installment in the Ivy Meadows Mystery series by Cindy Brown and it’s a fun-filled, humorous mystery worth reading.